Barbados should give MFC’s a look! Recently there has been much talk about the diverse means available of obtaining energy from renewable sources (solar, wave, wind as-well-as bio-diesel/gas). However, no mention has been made locally of the use of microbial fuel/factory cells (MFC’s). MFC’s are devices that convert chemical energy into electrical energy as do batteries, via the use of micro-organisms. Unlike batteries, MFC’s can sustain their output of electricity as long as the chemical input is maintained. Most bacteria are electrochemically inactive and cannot be used in MFC’s. Those bacteria which are capable of producing an electric current are called exoelectrogens. 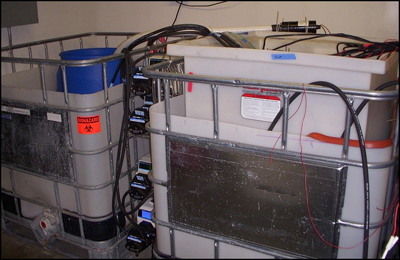 Exoelectrogens, when placed into a suitable medium, transfer electrons (negatively charged particles) to an electrode which has been inserted into the medium. This flow of electrons is facilitated by an active electron transport system, which carries electrons directly from the microbe’s respiratory system to the anode ((negatively charged electrode). Why did our Minister of Works and Transport endorse this technology company? Does he own stock? BREAKING HOT NEWS: Company paid up to $100,000 to certain websites to promote this stock! Did they pay anything to Minister of Transport John Boyce or any other Bajan? See end of story for details. Hon. Mr. John Boyce, Minister of Works and Transport as quoted in a press release and stock prospectus for Great Wall Builders Ltd.
Did Barbados Minister John Boyce receive any gift or benefit from Start Technologies or Great Wall Builders Ltd.? except… there have been many similar devices in history making the same claims about using electric current to modify the properties of fuel. There are even websites where engineers debunk this type of claim that electricity will change the molecular structure of fuel and result in significant mileage increases. Not to worry though: the Barbados Minister of Transport attests that the technology works. And it’s not just Bajan citizen John Boyce saying this: he is a Minister of the Government of Barbados and representative of the entire country, so his claim must be true… right? It must be because the credibility of our country and the government rests upon Mr. Boyce’s endorsement. Why are my warning antennae up and pulsating? The press release by GWBU reports that the Barbados Ministry of Transport and Works tested this new technology over a 2 month period and confirmed the claims of the company. Imagine what a 20% fuel saving could do for the world! With that kind of savings the West could tell the Arabs to shove it where the sun doan shine. That would be the end of the UK’s travel duty. Cruise ships will flock to Bim because they will use 20% less fuel. This is big. Really big… and the stock price soared! So the stock price of GWBU must go up… and up it went! Nine cents a share to a buck seventy three in a few of weeks! I wonder if Transport Minister Boyce or his family members or close friends have any of this stock? Good. That’s great to see entrepreneurship and progressive capitalism at its best: making money and saving the planet. Hey… Minister Boyce… we are saving the planet with this device, right? In today’s “things I never thought of before” department, our old friend “H” sends the above video to BFP. After watching it twice I had to think whether or not I care that the authorities could access the smart meter data and gain a window into my boring life. No smart meter for me, thanks! We’ve added Green Antillies blog to our sidebar links and we hope you enjoy the news, stories and links as much as we do. Our friend Thérèse Yarde takes a little bit of Caribbean environmental news, mixes in some alternative energy features and stories about wildlife, reefs and agriculture to create a superb daily read. If you are interested in Caribbean environment, nature conservation and energy, Green Antillies.com is for you! My most recent electric bill showed a significant increase. My energy charges totaled $252.50 while the fuel charge was $549.16. If paid before the discount date, the Barbados Light & Power (BL&P) would reward me with a discount amounting to around $30.00. I will not be hooked by such insignificant bait. Originally, fuel was an input in the production process of the BL&P; now it is both an input, and an add-on. An apt analogy would be the case of a baker selling a loaf of bread and charging extra for the flour used to make it. Currently, Barbados is experiencing challenging economic times. A period characterized by lay-offs, calls for Unions to exercise wage restraint, and the common sight of persons having to leave items at the cash register in the supermarket. There has been a slight increase in the price of Liquefied Petroleum Gas (LPG). Rawdon Adams on the Barbados Light & Power fire sale. 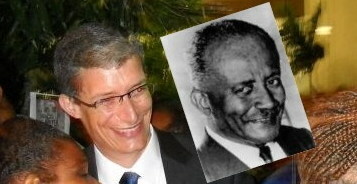 Rawdon ‘Rawdi’ Adams is the grandson of nation-builder Grantley Adams (With Rawdi in the above photo… look at the eyes! the chin, the nose, the smile!) and the son of our second Prime Minister Tom Adams. Rawdi has much to say about Barbados and Bajan politics these days. Will he be returning home anytime soon? In light of the disastrous split in the current BLP leadership that question has been coming up lately at a few rum shops. Never say never, you know! Rawdi published an opinion piece at The Barbados Advocate and we’re going to repeat it in full here. You really should go to the Advocate to read it, but given that paper’s history of erasing the truth and their archives we’re going to leave the whole article up here for the record. But please, visit the Barbados Advocate to read the piece and then leave your comment here if you desire. Come January 24, Barbados Light & Power Holdings (BL&P) is set to pass into foreign hands. In an era when some nations block foreign takeovers of even yogurt makers on the grounds that they are “strategic assets” (as France did when Pepsi wooed Danone in 2005) it is surprising to see the truly strategic BL&P up for sale to a foreign buyer with so little reaction from the Barbados Government. It does, after all, control nearly one quarter of the company’s equity via the National Insurance Scheme (NIS).